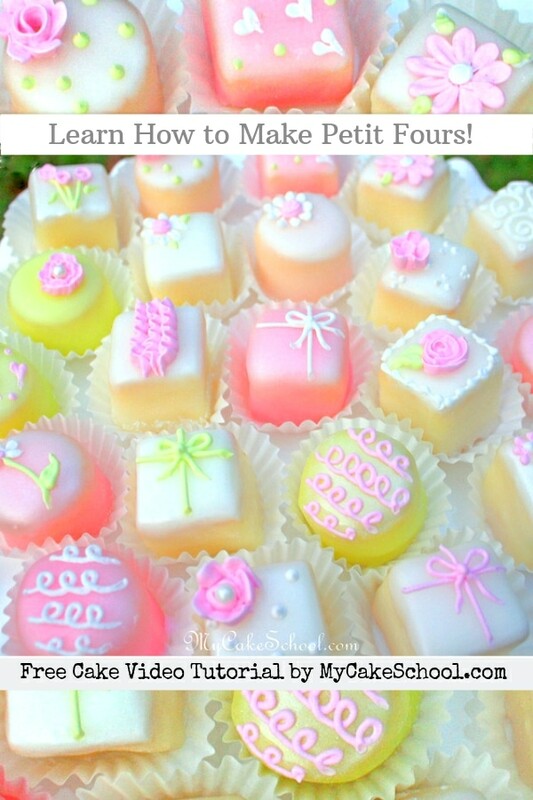 How to Make Petit Fours~A Video Tutorial! Hi everyone, today I’m going to show you how to make petit fours! I really wasn’t sure if this day would ever come, because until very recently, my petit fours always seemed to fall short. The Challenge of Making Petit Fours! Before I had an easy method for making petit fours (which I share in the video), they were NOT fun for me to make. Who would guess that such tiny little cakes could be so difficult? Either they were too bumpy, or they weren’t uniform when they were sliced, or they fell apart when they were glazed, the kitchen was a disaster afterwards… the list goes on! 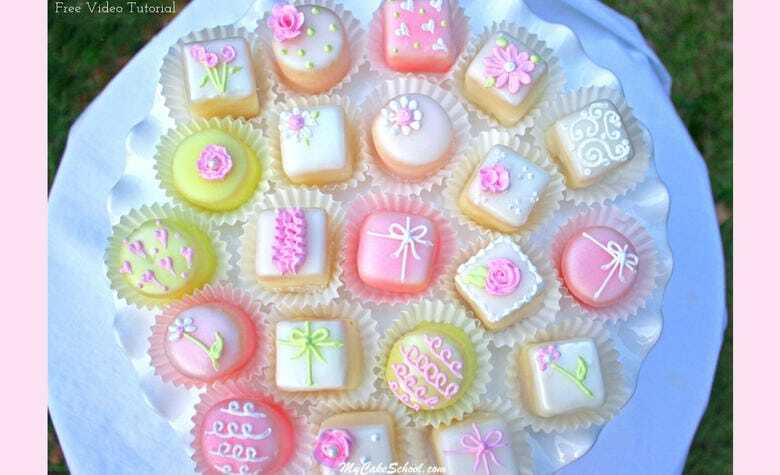 There are two petit four icings that I like. One, which was already in the recipes section (and that I discuss in our video on glazing cupcakes) is called King Arthur Flour Poured Fondant. I really love the flavor of this recipe, which includes a little white chocolate. However, in today’s video, I tried another commonly used petit four glaze recipe, and it has become our FAVORITE. This is the one that we’ll refer to in the Recipes section as Classic Petit Four Glaze. It is very similar to a Martha Stewart recipe that we found online, but also very similar to many other glaze recipes. (Not sure who to credit for this one). Anyway, this traditional glaze is even whiter than the King Arthur Flour Poured Fondant recipe, and for us, it coated a little more smoothly and was a little whiter in color. It does dry firmer though. So, it comes down to personal preference (as I say so often!) ;0) — I did really like this “traditional” recipe a lot…the key is not to make your icing too thick. Otherwise, you will have a very firm “sugar shell” to bite thorough (which some may like…others may find too sweet.) We kept our icing thin. The other important factor in successful petit fours is your cake! We used a pound cake recipe that we really like, and we will put in our recipes section. You want to use a dense cake which can be easily cut without creating a ragged edge. You also want to work with frozen cake, so that you will eliminate almost all crumbs and the cakes will not be fragile. These two tips alone are going to make petit fours so much easier! In the video, we demonstrate a few methods of coating the cakes which I like, and also how to fill your cakes with a filling if you would like that extra layer of flavor. While some people make petit fours with a thinly rolled layer of marzipan just beneath the icing, we chose to use a thin layer of buttercream. With a little trial and error, we rigged up a funny setup for seamless petit four glazing, but it works SO well! Basically, we needed to figure out an easy way to remove the petit fours from the skewer in a way that would allow the excess glaze to drip away from the cakes rather than pool around the bottom, and we also wanted an easy way to remove the cakes from the skewer without touching them! As you’ll see in the video, elevating our cooling racks was the key to making this all work! Hooray! I’ll never make petit fours another way. I hope that you enjoy the video! Please remember to scroll beneath the video for materials used and other helpful tips! Buttercream- We used a thin layer of our “fluffy vanilla” recipe. Any frosting will do! Rolled marzipan or fondant are alternatives to the frosting beneath the petit four glaze. Piping Tips: I used a Wilton Tip 2 for my lines, scrolls, dots, hearts & daisies, A Wilton 59 petal tip for ruffles or any small petal tip will do, Wilton 102 (or any small petal tip) for roses. Candy Thermometer- Optional. You could also just eyeball it. My icing was approximately 115 degrees F…but I show what the desired consistency looks like in the video. Metal bowl that will fit over a pot of simmering water–This is ideal and makes life easier than having to keep rewarming the icing in the microwave when it becomes too thick & cool. Tools: Sharp knife for scoring and cutting squares, Ruler for measuring, Round cutter (or desired shapes) if you’d like to have variety. My round cutter was 1 1/4 inches wide and 1 1/2 inch tall. Cake Board- optional but is helpful if splitting your layers. Preserves/Jam/Desired filling or frosting if you would like to fill your petit fours. After filming our video, we decided to go back and add one more demonstration of the process splitting of the cake layer to add preserves/jam. Many petit fours are layered in this way, and it is nice to have an extra layer of flavor! This does add another degree of difficulty though. I love the way the solid cake squares came out also, so don’t feel pressure to do this step! If you do add a layer of raspberry as we did for some of our cakes, just be aware that you will be able to see the pink stripe through the glaze. This doesn’t ruin the effect at all for me, in fact, it adds a little interest. But, I wanted you to be aware. -Something else that I noticed is that the white frosting layer showed through ever so slightly with the petit fours that were coated with pink and green glaze. The remedy for this if it bothers you is to frost your petit fours with tinted frosting before glazing. Again, this did not bother me but I wanted to point it out. -Frozen cake is really key in successfully cutting, dipping, or coating your cakes! Remember to chill/freeze your cakes after frosting them so that the frosting will not melt or slide when dipped! Please let me know if you have any questions! Good luck with your petit fours! I’d love to hear how they come out! Hi Melissa – in June 2014 I was making some of these for the first time. After watching your tutorial it gave me confidence to tackle this project. I completely forgot to send you a pic to show you what mine looked like. The cakes turned out great and was a big hit. 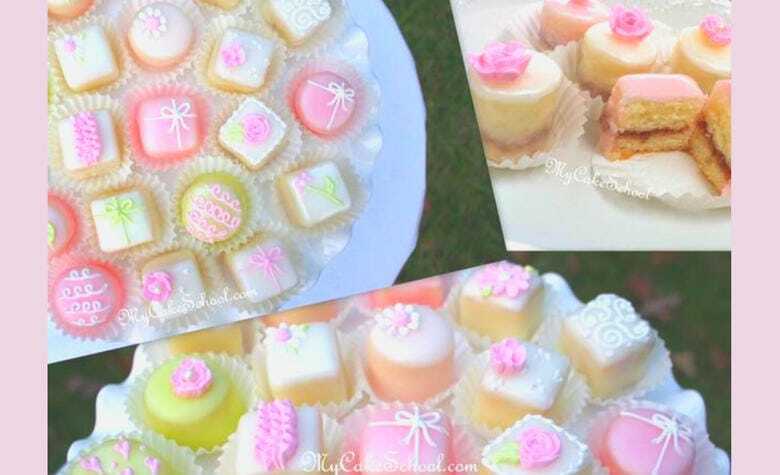 I have some petits fours to make for my friends birthday – I’m not so scared anymore! Will send you a picture when they are done. Great! We would love to see them! thank you so much for this video. My niece has requested petit fours for her wedding cake. This has helped me immensely! How do I figure out how many petit fours to make. Im assuming most people will take more than one. @CakesOnTheLane- Hello! I’m so glad that you found the video helpful! Hmmm….that’s a good question. Will there be other desserts there? I feel like most people wouldn’t take more than three…maybe 2 if there are other sweets. I just did a quick google search to see if I could find other opinions on this and found a reddit post on petit four servings- I hope this helps!